Thanks for stopping by The London Diaries, K.C.! Tell us a bit about yourself—where are you from? Why did you start writing? Thanks for having me on your site. I am from the Chicago area—born and raised. There are few cities as beautiful and inspirational as Chicago. I love traveling, watching black and white movies, and of course, reading everything I can get my hands on. I still read the cereal box like I did as a kid. As long as I can remember, I’ve been a storyteller. I love telling stories. I live in my own head. I can create a believable story about a person or event in minutes. It wasn’t until I was in high school that I started putting those stories on paper. And even though I’ve dabbled in other careers and held many jobs to get by, I know my gift is writing. Where did you get the inspiration for Nik’s List? I got my inspiration for Nik’s List one day at a local track meet. While there was plenty of excitement on the field, I couldn’t help listening to an interaction between two girls at the concession stand. They’d met a cute male runner from another school and the normal “girl talk” ensued. I smiled and thought back to my own high school experiences and the various crushes I had. I remember how important they were to me and all the angst that came with navigating the whole ‘relationship’ thing. So I thought I’d write a book about a girl who is pretty well put together for her age except when it comes to dealing with one of the topics that gives teens angst—that first real crush and dreaded first kiss. Talk to us about Nik, your main character. Would you describe her as a strong, positive female? Nik is a smart, ambitious teenager who is growing into a strong, positive young woman. She has a good head on her shoulders and a good heart. She is close to her parents and respects the lessons that they have taught her. However she—like many 15-year-olds—does something she shouldn’t, something she didn’t fully consider the consequences of. But she learns from it, and it’s the lessons in life and how we deal with them that determines how strong and positive we are. Nik’s List is told from the point of view of an African American teenager, which is something you don’t get to see much of in YA fiction. What made you want to write Nik’s List from that perspective? As an African American, it’s my worldview. Besides that, I wanted to write a story that shows that we are all the same when it comes to basic human emotions. Nik’s story can be any teen girl’s story. I believe readers of any race will relate to the characters and will be transported back to their own teen years and the insecurities that came with them. What other books would you recommend in the same genre? I would suggest that fans of YA fiction read as many books in the genre by as many different authors as possible. There are so many fantastic voices out there. Right now, I am reading Swallowing Stones by Joyce McDonald. I recently finished An Abundance of Katherine’s by John Green. I plan to reread The Watsons Go to Birmingham by Christopher Paul Curtis because it’s being made into a movie and I like being able to compare how closely the movie follows the book. I also recommend Monster by Walter Dean Myers, and any of Sharon Draper’s books. Finally, everyone should read Judy Blume. I am writing my next YA book as well as a stage play that I hope to see produced one day. I also plan to continue Nik’s story. I write little snippets from Nik’s ‘life’ on her blog, but I plan to write another book soon. Lastly, a question I ask all of my interviewees! Hemingway once wrote a story in just six words (“For sale: baby shoes, never worn.”). What would be your six word story for your life so far? I love; I laugh; I write. 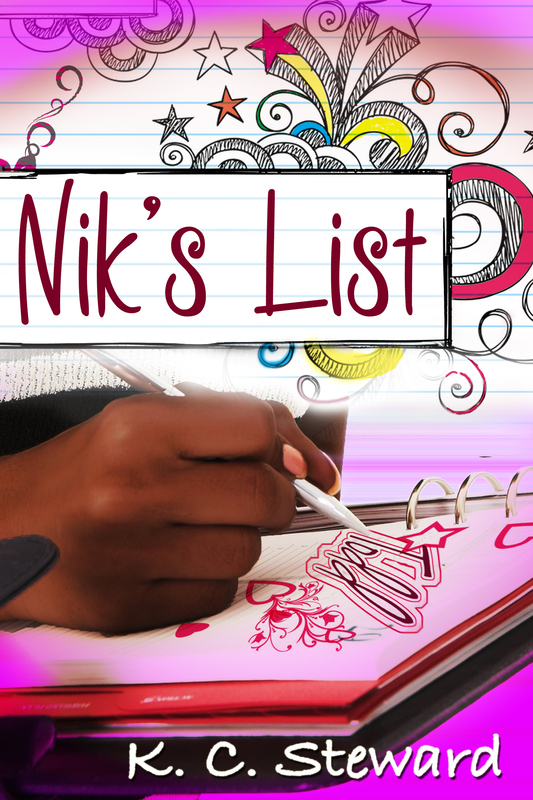 ‘Nik’s List’ can be found online on Amazon UK, Amazon US and on Smashwords. ‹ PreviousThe Striker’s Chance… OUT NOW! Next ›Woman Walks into a Bar….